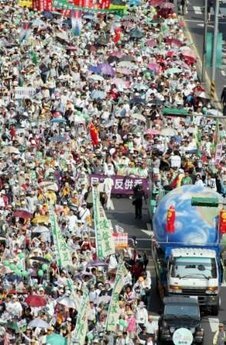 The rally in Taipei was held under the banner “Protect Democracy and Stand against Forceful Annexation”. Speaking to more than 100,000 protesters, Taiwan President Chen Shui-bian told the crowd that Taiwan is an independent, sovereign state. He said the island’s future should not be decided by China. The rally comes amid this week’s one-year anniversary of China’s approval of an anti-secession law. The law says China will employ “non-peaceful means” to prevent Taiwan’s independence if efforts at peaceful reunification fail. Mr. Chen angered Beijing last month when he decided to stop funding a unification council and scrap guidelines for reunification with China. The words of President Chen were sure to anger the leaders back in Beijing who passed the Anti-Secession law one year ago. Protesters on the three-hour march held balloons and waved banners as a flatbed truck hauled a large globe surrounded by red likenesses of missiles bearing the Chinese flag. The rally, under the banner of “Protect democracy, oppose annexation,” was held on the anniversary of a law passed in Beijing last year that threatens to use force if Taiwan becomes independent. 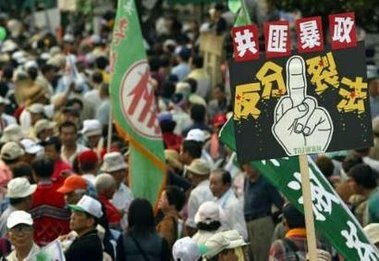 The protest came less than a week after the opposition Nationalists mobilized an estimated 40,000 demonstrators, accusing Chen of stoking tensions between Taiwan and China. Several thousand Taiwanese Opposition Party members protested on Sunday against what they call the president’s “China-provoking” policies. Mad Minerva has more on Saturday’s protest.